A long overdue post, primarily because I’ve been waiting for a specific photo… Figured I’d go without it and post it when I get it. That evening was spent showing off the half-covered layout to both Syl and a really tired Jason. James Powell came by on the late side and had a good look around, but despite his offer to help with the cleaning, figured enough rest for his trip back to Vancouver Island was a better idea. All were really impressed, but I wish I had things a little further along to show them the layout without all the sawdust. Thursday saw Cam arriving early-ish and we seriously attacked the layout and got it all cleaned up, track polished and all ready to go for Friday. 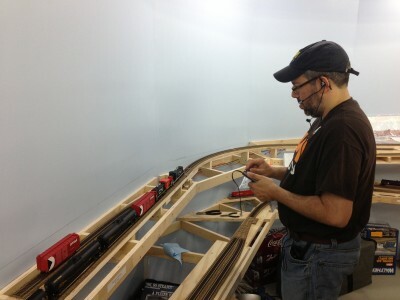 Got most of the Quad-LN’s programmed for basic addresses (the rest will come later) and a few more cars were prepared and the pair of Atlas GP38AC’s were unveiled. Sans paint and handrails but looking really good. 3000 and 3004 will be very special units when they’re complete – thanks Cam! Jason expertly pilots CN GMD-1’s 1011 and 1021 past the Fletcher’s Furniture spur. On account of a lack of working motive power on the island, the superintendent of the E&N made some phone calls to CN and acquired the use of GMD-1’s 1011 and 1012. 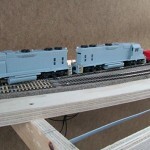 These locos were dispatched to service the Nanaimo Switch Job. I…err, make that the E&N Superintendent didn’t send them anywhere else on account of the larger trucks. Joking aside, things went quite well considering the first ops session is supposed to discover all the bad things and after all was said and done (and Jason on his way back to Edmonton), there weren’t that many things discussed which were horribly wrong. Most issues could be chalked up to not having enough time prior to set things up. Yes, there’s still more programming of the Quad-LN’s to do, operations stuff to setup in JMRI (to generate the switch lists), and rolling stock to prepare. This will no doubt lead to a lot of re-numbering and patching of rolling stock, in addition to more wheelsets and couplers to change out. Memo to rolling stock manufacturers: please no glued on coupler box lids, okay? All in all, Cam and I are really stoked on how well things went. We’re still nowhere close to being finished though… But that’s enough for now! This entry was posted on August 6, 2013. It was filed under Operations, Wiring. Good to see the review of the operating session, and that it went well. 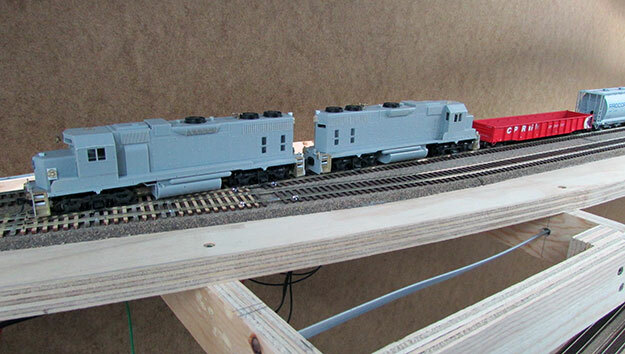 The layout looks like a fantastic operating layout, and I had a very enjoyable visit.